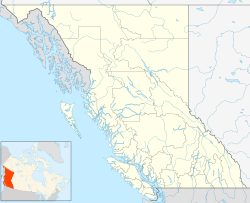 Beaton, formerly Thomson's Landing and also formerly known as Evansport, is a locality and former townsite and steamboat landing at the head of Beaton Arm at the head of Upper Arrow Lake in the Kootenay Country of British Columbia, Canada. There were 65 residents of Beaton in 1911. Ferry service was cancelled in 1964, with the post office being closed in 1969, although the locality remains partly inhabited today. Other towns in the vicinity included Comaplix, Camborne and Arrowhead, among others. Access today is from the Galena Bay ferry terminal north of Nakusp, which is the only remaining major town in the area, which had at one time been busy with galena mining prospects. The original name Thomson's Landing was from that of the owner of the townsite, James William Thomson, who was the local Notary Public in 1901. Thomson's partner was Malcolm Beaton, publisher of the Nelson Miner in Nelson. Beaton took over the townsite from Thomson in 1907, though the name Beaton was already in use by 1902. ^ "Beaton (locality)". BC Geographical Names.